Absolute Machine Tools is the new exclusive Distributor of LICO Screw Machines. A transaction that makes Absolute Machine Tools the exclusive importer/distributor of original equipment manufacturer, LICO Machinery Company, Taichung, Taiwan. Absolute Machine Tools will now be providing parts, service, and turnkey applications engineering support out of its technical center located in Mason, Ohio. 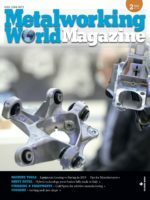 Customers who have product warranties and service agreements from Advanced Machinery Solutions have been transferred to Absolute Machine Tools and will be honored through the contract periods. LICO Machinery has been manufacturing multi-slide screw machines since 1978 (CNC cam machines until early 1990s). LICO introduced their CNC products here in the United States in 1990 by opening its own manufacturing operations in Texas. LICO’s Texas plant produced various specialty parts for the U.S. automotive industry. In 1996, with the introduction of the LNTS line, LICO became ISO-9000 certified, and in 2001 internationally CE approved. The Society of Manufacturing Engineers and the Taiwan Ministry of Economics awarded LICO the Innovative Research Award in 2002. In 2005, LICO developed the LNC-D 12-position screw machine with live tools, sub-spindle, Y-axis, and automatic bar feeding. 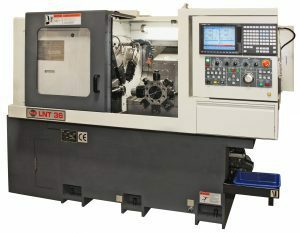 Five years later in 2010, LICO introduced the LND series machine with an opposed counter spindle for longer parts, XYZ-axis live turret, and up to three XZ axes cross slides. LICO’s LNTS and LNDD series screw machines are the pride of the product line. The LNTS is ruggedly built and capable of form tool use with each slide having a full 2-axis servo-controlled travel. The LNTS, with 3 or 4 multi-slides and an 8-position turret, can overlap up to 5 tools at once. For medium to complex parts, it can match the speed of cam machines; however the benefits do not end there. A turret-mounted pickoff spindle is standard and the base machine comes with a gang platform supporting 3 backworking tools. The LNTS series offers an optional, 8-position static backworking turret. Each main turret position accepts VDI-30 live tooling with four live tool holders being standard. With spindle sizes ranging from 36mm (1.4”) to 65mm (2.55”), these machines cover a wide range of applications, plus there is a three-turret model for extensive backworking and another model equipped with a Y-axis gang tooled cross slide for both static and live tools. For the most demanding work, LICO’s LNDD series machines are powerful automatic screw machines equipped with an independent counter spindle. The LNDD machines feature overlapping slides for maximized productivity and excellent size control. These machines are offered in 4 spindle sizes: 42mm, 65mm, 80mm, and 100mm. The base machines are delivered with two 2-axis cross slides around the main spindle, an 8-position 2-axis VDI 30 turret that is double tooled for working both main and counter spindles, and a fully independent counter spindle. Outfitted with live tooling on the turret (up to 16 live tools) this machine changes from turning center to a machine that can handle cross drilling, tapping, slotting, and basic milling. Add a Y-axis to the live turret and you have a double spindle turning and milling machine (both C-axis capable) with the capability of overlapping four tools at once (2 cross slides and 2 turret). Add a 3rd cross slide and extend your overlapping ability. Add an XYZ gang tool and the machine becomes a twin spindle (synchronized double C-axes), twin Y turret machine with simultaneous machining. The live turret uses VDI 30 holders and can use live tooling in any position. The LNDD comes standard with high-pressure coolant and weighs in at 10,000 lbs.